Bengaluru-based Natyaguru Poornima Gururaja got attracted to Bharatanatyam at a very young age and has a career span of 20 years on stage and over 10 years as a renowned dance guru. BENGALURU: Bengaluru-based Natyaguru Poornima Gururaja got attracted to Bharatanatyam at a very young age and has a career span of 20 years on stage and over 10 years as a renowned dance guru. Prime disciple of Guru Smt Narmada, a senior disciple of legendary Guru Shri Kittappa Pillai of Tanjavur, Poornima Gururaja can be acknowledged as an exponent of the Tanjore parampara, a custom characterised by grace, finesse and aesthetic appeal. As a guru, she strongly endorses the principles of discipline and punctuality. Poornima has presented over 14 rangapraveshams till date with a new choreography for each one. Following her stay in Boston, where she founded her dance academy Pallavi school of dance, she returned back to India and found her brainchild ‘Kalasindhu Academy of Dance and Related Arts’ in 2007. “Apart from dance, I included the study of Sanskrit in my academy as it is essential to understand Natya Shastra and shlokas. Learning Sanskrit helps this,” Poornima Gururaja says. Recollecting her memories of teaching in Boston, Poornima tells how her students were extraordinarily physically fit and disciplined, but also struggled a bit. “There is no exposure to tropical climate, temples, elephants and fresh flowers, which are the essence of Bharatanatyam. So the metaphors we use in this dance form like the lotus and elephants were very alien to them. But in India, the scene is different. It is easier for the students to relate to the metaphors as they know what their underlying meanings are,” she asserts. Her teaching career with Kalasindhu completes ten years since its inception this March. To celebrate this feat, she will host a two-day event ‘Nirantara Narmada festival’, that was initiated in memory of her beloved teacher Natyavisharade Guru Smt Narmada. The theme of the two-day long celebration will be based on a blend of Mysuru-Tanjavur culture. The first day’s programme will be an ode to the Mysuru royalty who have patronised Bharatanatyam for over 400 years. The second day has in store celebration of the Tanjavur parampara. The highlight of this day would be Charumati’s (Kittappa Pillai’s grand daughter) performance. This performance is very significant from a feminist view because coming from a patriarchal lineage, she’s the first girl in the family to perform on stage. 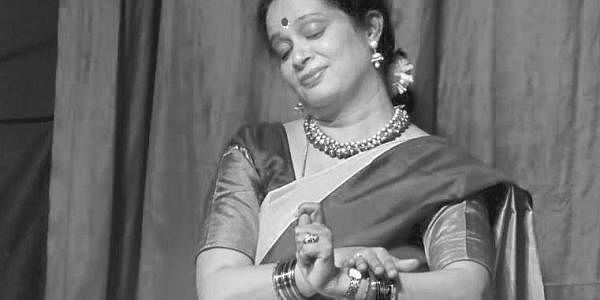 At Kalasindhu, she has in the past organised several masterclasses where in dance maestros such as Yamini Krishnamurthy, Indira Rajan, Kittappa Pillai’s son C V Chandrasekhar have conducted sessions for her students. Poornima believes that learning knows no boundary and with greater exposure comes profound learning.